FRUIT BODY: 2-5cm in diameter. Crookedly rounded to oval/kidney-shaped each bracket has an uneven concentrically zoned upper surface that is primarily orange but has shades of green and brown within. Feeling soft and hairy at first the surface becomes coarser with age and darkens somewhat. GILLS/PORES: Gills are thick and have a maze-like appearance. Ochraceous orange in colour. FLESH: Rusty-brown with no distinct taste or smell. Thick and corky. SPORES: White, cylindric. HABITAT: Found mainly decomposing coniferous wood and more often than not park benches, tables and other such timber. 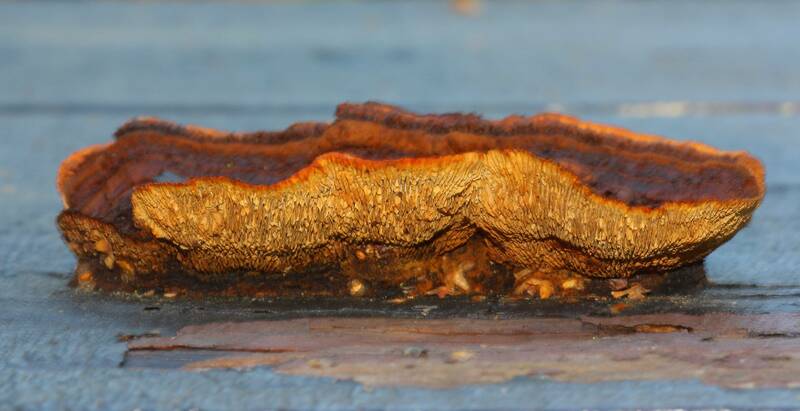 This species causes intense brown rot. Take note though - this species can be found on deciduous wood. SEASON: Infrequent throughout the year but sporulating in autumn. EDIBILITY: Inedible.